With five simple words, "the president denied the merger," President Trump's new lawyer Rudy Giuliani contradicted months of statements by the White House and the Justice Department. 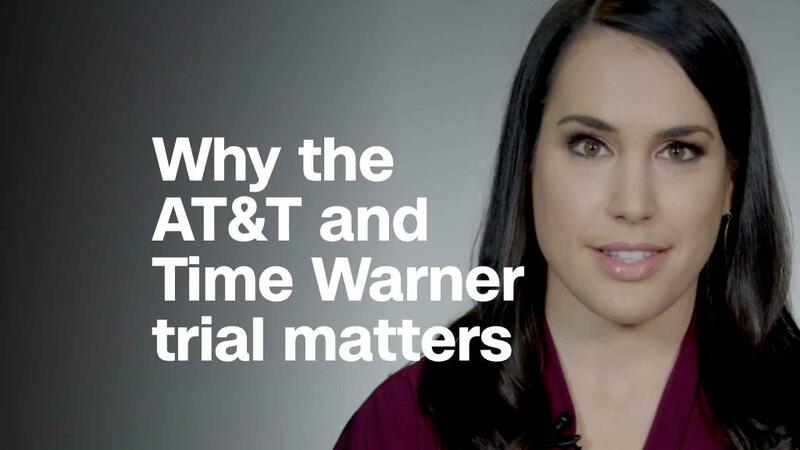 The subject was AT&T's $85 billion bid for Time Warner, the parent company of CNN. Giuliani is now back-tracking. "He told me directly he didn't interfere," Giuliani told CNN's Dana Bash on Saturday morning. But the back-and-forth has done two things: It has reignited a simmering controversy over possible political interference. And it has people talking again about Giuliani's habit of making things more complicated for his client. That's why it was so surprising when HuffPost quoted Giuliani saying "the president denied the merger." When the government sued to block the AT&T (T)deal last fall, officials denied that Trump had any hand in the decision. On Saturday morning, the White House said Giuliani got it wrong. "The Department of Justice denied the deal," press secretary Sarah Sanders told CNN Saturday morning, reiterating the administration's past position. In the HuffPost interview, Giuliani was seemingly trying to defend the president against any suggestion that Michael Cohen improperly influenced the administration after the revelation that Cohen, Trump's longtime personal attorney, was paid large sums of money by AT&T and several other corporate clients. "Whatever lobbying was done didn't reach the president," Giuliani said, repeating a claim he made to CNN's Dana Bash on Thursday. But he went further with HuffPost on Friday, saying "he did drain the swamp... The president denied the merger. They didn't get the result they wanted." The assertion that "the president denied the merger" flew in the face of everything the government has previously said about the deal. On Saturday, Giuliani sought to clarify. While Trump has been consistent about his opposition to the AT&T deal, "he didn't interfere" with the Justice Department case, Giuliani told CNN. Giuliani said he was trying to say that AT&T's payments to Cohen didn't sway Trump's personal point of view about the deal. In other words: If AT&T hired Cohen to win the government's approval, AT&T wasted its $600,000. This story is part of a pattern of Giuliani missteps. Since he began representing Trump last month, multiple Giuliani gaffes have been in the headlines. He has had to revise his public comments about Stormy Daniels and what Trump knew or didn't know --and when-- about the payment Cohen made to her. His comments about AT&T are notable because a political cloud has been hanging over the deal since day one. The outstanding question: Did politics and Trump influence the DOJ's decision? On the day AT&T announced its bid to buy Time Warner, the parent company of CNN, then-candidate Trump said he opposed the deal. So when he took office, there were concerns within AT&T and Time Warner that he or his aides would try to block the deal. AT&T said earlier this week that it hired Cohen, in part, to gain "insights" about the Trump administration's thinking about the deal. Throughout 2017, career officials at the Justice Department's antitrust division conducted a standard review of the proposed deal. The DOJ traditionally operates with a lot of independence. But there were persistent questions about possible political interference, especially in light of the president's well-publicized disdain for both CNN and attorney general Jeff Sessions. Still, AT&T and Time Warner executives believed the deal would receive DOJ approval, much like Comcast's acquisition of NBCUniversal did nearly a decade ago. By October, they thought the thumbs-up was right around the corner. They were wrong. In November, the DOJ went to court to block the deal, alleging that the combination of the two companies would give AT&T too much power in the marketplace. That's when questions about Trump's hidden hand got really loud. Democratic lawmakers raised alarms. So did AT&T and Time Warner. Other critics pointed out Trump's complaints about Sessions and the DOJ. Trump had recently been quoted saying "I'm not supposed to be involved in the Justice Department," adding, "I'm not supposed to be doing the kinds of things I would LOVE to be doing, and I'm very frustrated by it." But White House aides like Kellyanne Conway insisted that the White House was not interfering. In a statement in November, deputy press secretary Raj Shah said "the President did not speak with the Attorney General about this matter, and no White House official was authorized to speak with the Department of Justice on this matter." The DOJ's antitrust chief, Makan Delrahim, also publicly denied being influenced by Trump. And in a sworn affidavit, he said "all of my decisions" about suing to block the deal "have been made on the merits, without regard to political considerations." "At no time did I receive orders, instructions or directions relating to the transaction or the decision to file the complaint" from Trump, Sessions or their staffers, Delrahim said. Ahead of the trial, AT&T and Time Warner sought discovery on any relevant communications between the White House and the Justice Department. But a judge denied the request, and the companies dropped any courtroom argument that the case was motivated by politics. Outside the courthouse, however, the questions continued to swirl. The judge in the case is expected to issue a ruling by or on June 12. -- CNN's Abby Phillip and Hadas Gold contributed reporting.